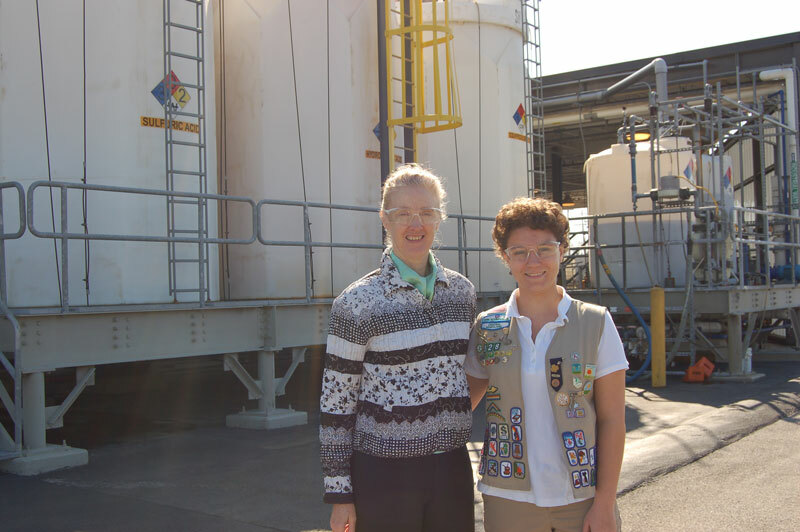 When Girl Scout Allison shadowed President of Maryland Chemical, Jeanette Glose Partlow, she got the unique opportunity to see a new side of a field she was already interested in–science. Allison, who said she’d like to be a STEM (science, technology, engineering, and math) teacher, said she was glad to be able to see what it was like to work in the field outside of a classroom setting. Ms. Partlow took Allison on a tour of the Maryland Chemical offices and warehouse and explained what happens on a day to day basis, how orders are handled, and how the facility was specially designed to increase green space in the area and safely handle chemical spills or fires if an emergency were to occur. “Spending the day with Allison gave me a chance to reflect on what I do and why I do it, and to relay it to a future leader of tomorrow,” Ms. Partlow said. Proceeds from the Distinguished Women’s Awards Reception and Online Auction support Girl Scout leadership programs like the Distinguished Women shadow days. Allison and Ms. Partlow will speak at the Distinguished Women’s Awards Reception on Thursday, April 26, at 5:30 pm at the Baltimore Country Club in Roland Park–click here to learn more or to buy tickets. The Distinguished Women’s Online Auction runs from April 4 to April 18–click here to visit the auction page. For more information about the Distinguished Women program or to become a sponsor, contact Maria Darby at mjohnson@gscm.org.